what if you can wear make-up all day long without it spoiling off when you cry or sweat ? what if you apply your make-up before going to bed and sleep with it , so when you wake up in the morning you have one less thing to worry about?what if I tell you , it is actually possible , Yes its Mineral make-up and it has been there for more than 30 years . Recently Mineral make-up is gaining more popularity and people are getting more aware that, it is made up of natural minerals an does not contain any preservative, chemicals, yes, perfume, talc or alcohol. The most common feedback form men and women about mineral make-up is that, the feeling is very natural, and creates a long lasting radiance. Its never feels like wearing a mask, like chemical based make-up. 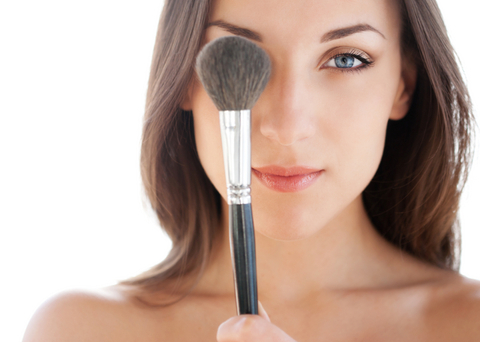 Mineral make-up is the best option for people with sensitive skin, which prone to acne or rosacea. How Good is Mineral make-up? Mineral make-up is made up of minerals like Titanium, Gold, Zinc, Aluminium and Magnesium, these mineral are good for skin. These minerals decrease wrinkles and also protects skin against UV Rays form sun, as it is found to have SPF 15 due to the presence of zinc oxide and titanium.Mineral make actually nourish your skin ,its very easy to apply and remove.It does not clog your pores, it the best option, if you are suffering form allergy and can not tolerate any artificial chemicals, color or perfumes. But exceptions are always there, as few people, who complain that, it irritates and add wrinkles , it possibly due the allergy that some people might have towards some minerals. Its is best to try different make-up like blushes or powder foundation to see which best suite your skin . These are different types of mineral make-up like eye shadow, eyeliners, make up for cheek and entire face . Be aware while purchasing minerals make-up as even 1% mineral content can bear the mineral label. So when shopping for makeup, be sure to read the ingredient list well and stick to a reputable brand.